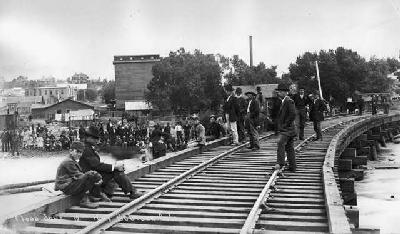 New rail bridge over Boulder Creek taken in 1897 near Broadway. Photo copyright by the Denver Public Library. Visit the BASIN Gallery for more historic images. The Nellie Bly mill suffered considerable from the sudden downpour of water. The entire machinery of the mill was silenced by the rush of water into it, carrying along great quantities of sand. The water rose to a depth of over a foot on the roaster floor, nearly putting out the fires and half covered one of the engines with sand and gravel, wrecking it badly. "The system of water works on the Keystone gulch, from which the company takes it water, was practically demolished, and will be entirely useless until repaired. The large ore bins for the storage of ore and which at the time were quite full, were only prevented from being completely demolished by the rushing waters, through the combined efforts of the entire mill force, who turned out in the worst of the down pour and diverted the water by means of ditches. The bins are now in a dangerous condition, and need at once new foundations. "At one time, the Keystone mine was in imminent danger of being flooded by a tremendous stream which tore its way down the mountain sides. Mr. Seely, the superintendent of the mine, gave the danger signal and called all the miners from the underground workings, but fortunately the stream passed to one side of the shaft and a real calamity was narrowly averted. It will require several days to repair the damage done to the mill and to put the machinery again in good running order." "The cloud burst carried away the dance hall and the back part of Coffee's store at Sunset and destroyed the road between that place and Ward. Ira Monell's mill at Salina was damaged to the amount of $500." Information compiled by Elizabeth Black. INVITATION BASIN is a community project actively seeking public participation. We appreciate all feedback and welcome comments, suggestions and contributions. To find out more about how you can be involved, click here. Help BASIN serve your needs, take our "10 questions in 10 seconds" survey.